The popularity of a certain Ford Car that has become the best-selling car in the UK (yes, obviously it's the Focus!) has left a rather bitter taste in the mouths of the rest of the manufacturers. They are wondering what they have to do to get even a modest percentage of Ford's market-share. I don't blame them for being confused, as this appears to be a conundrum with no particular right answer. Many manufacturers have produced family-sized hatchbacks that have rivaled the Focus in terms of quality, drive ability and reliability, so it would appear that the battle is more about branding and reputation than any other attributes. 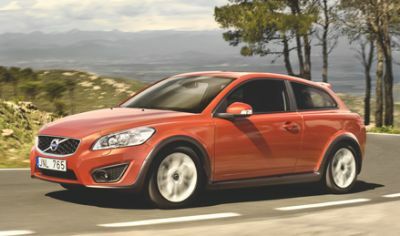 How is Volvo's C30 going to fair in the family-car wars then? Volvo's effort looks eerily similar to the Focus, which struck me as rather odd for a car manufacturer who have had such distinctive car designs in the past. Volvo are largely synonymous with large and occasionally over-bearing estates, but in recent years they have branched out into decent saloons and relatively popular 4X4s. The addition of a family hatchback to the range seems to be a move from a company looking to be an all encompassing vehicular behemoth. The C30 is based on the Ford C1 platform, so there were no surprises that the C30's drive felt unnervingly similar to the Focus. The chunky feel of the driving instruments and the firm, but not uncomfortable seat are practically identical between the Ford and the Volvo. So much so that if I closed my eyes I would be hard-pushed to recognize which one I was in. This isn't necessarily a bad thing though, as has been proved many times, the Focus is a great drive for a great price. So to split these two apart, price may be the deciding factor. The Volvo C30 starts off at around £14,995, which is a slightly awkward price given that a similar spec on the Focus comes in at around 3-4 grand cheaper. Here we have two relatively identical cars, yet such a gulf in price. It's no wonder that the Focus has got such a stranglehold over the competition. The question begs then, what are you paying all that extra money for? It's not the badge surely? It's definitely not a load of extras. So what precisely is it?